In the years preceding, during and after the Second World War, the notion of citizenship with its links to nationality and legal protection by the state underwent radical change. Nazi policies had enforced a strict categorisation and isolation of citizens, with genocide as the ultimate consequence. German aggression and ideological constructions of Germanness and Brudervölkern had a major impact on the meaning of German nationality after the German capitulation as well. Occupied by Germany from 10 May 1940, the Dutch government in exile in 1944 declared all German nationals in the Kingdom of the Netherlands to be enemy citizens. Soon after the German capitulation in 1945, ten thousands of Germans were stripped of their assets, regardless of political allegiance or place of residence and without any Dutch compensation. Some were imprisoned or deported, others left at their own initiative. The project Germans as enemy citizens researches these Dutch policies, as a case in point to investigate how citizenship has been further put to the test after the Second World War. Citizenship entitlements provide specific mechanisms of inclusion and exclusion in transitional times. In this research citizenship is approached as an essentially contested concept, related to changing sets of definitions in terms of legal status, privileges and rights, social and political engagement and identity. Before 1940, thousands of German nationals held residence in the Netherlands and its overseas territories. Some had a residence permit, such as Grenzbauern, migrant labourers and housemates, or were German through marriage. Others lived and worked as missionaries, artists and entrepreneurs in Suriname or the Dutch East Indies, or were – now stateless – German Jewish refugees without a Dutch legal status. After 1944, all Germans in the Netherlands were politically categorised as enemy, a decision against which they could appeal. Who were these Germans and what did their German citizenship imply for them? How did international discourse on ‘collective guilt’ and human rights affect Dutch politics on Germans and citizenship in the aftermath of the Second World War? And, how can these Dutch post-war policies be understood in a more global framework? These are central questions in this PhD project (2015-2019). Internationally, research on Heimatvertriebenen, or homeland expellees, and German refugees and emigrants who themselves or whose ancestors had involuntarily lost German citizenship in other European countries, has resulted in a vast amount of literature. However, regarding the Netherlands, the history of Germans post-1945, as part of the post-war legal redress in general, has received little attention from historians and has long been separated from the historiography about the Second World War. Little research has been done on the German minority in the Netherlands and its overseas territories after May 1945, and to this day it is unclear how many people were affected by the Dutch government’s judicial, economic and policy measures implemented. This can be explained by the trends and phases, the different approaches to the Second World War. For decades, the first post-war years in particular, debate was coloured by moralistic visions, based on the categorisation of ‘right-fully behaving Dutch’ and ‘guilty Germans’. It can also be explained by the fact that there are almost no diaries, memoirs or testimonies. The only source that can provide insight in the experiences of German enemy citizens is the extensive but little researched archive of the Dutch Property Administration Institute, an Institute that was authorized to detect, manage and liquidate confiscated German assets. The archive of the Dutch Property Administration Institute, stored in the National Archives in The Hague (NL), provides a valuable source to investigate the moral, political and financial considerations at stake in Dutch policies of restorative justice. It is the primary source for answers to questions like “who were declared enemy?”, “how were people categorised?”, and, “who was in a position to appeal against the verdict?”. Jurisprudence, letters of request for de-enemisation and in particular the defences of enemy citizens shed light on the Dutch post-war policies. However, to this day this archive of this Dutch Property Administration Institute has not been completely disclosed. 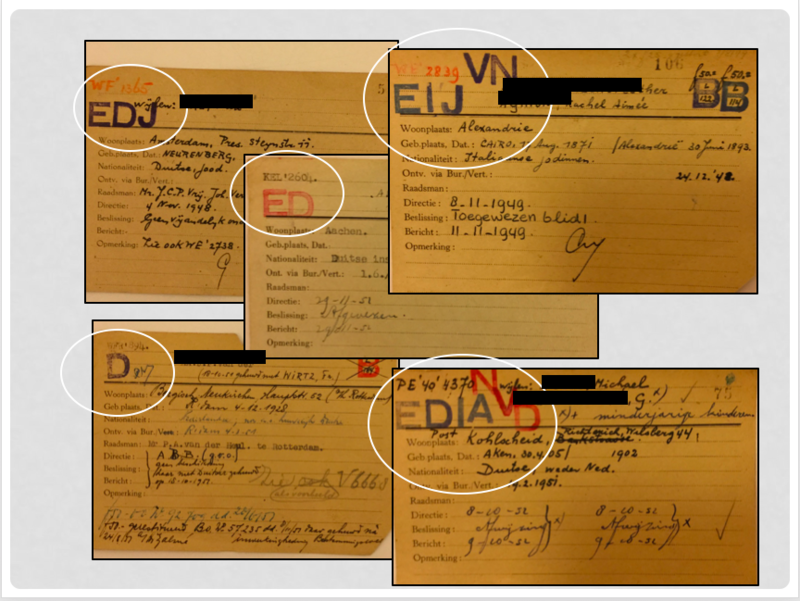 Direct access to the personal records of enemy citizens is due to the Personal Data Protection Act restricted, which makes both qualitative and quantitative research more than seventy years after WWII still almost impossible. 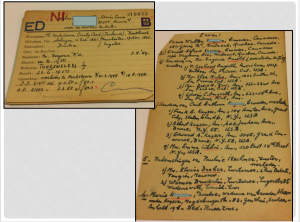 The only entry into this complex archive are the original paper index-cards (circa 25000 in total), used by secretaries then to organise and categorise their archives. These cards contain personal data such as names, nationality, place of birth and place of residence, but also the final court decision. With the information on these cards, I can submit a request to research the personal files. But, using digital tools, the data on these cards provide more interesting information. Therefore, to process and manage archival data, a database was designed. This database functions as an archive of an archive, which considering the fact that the archive of the Dutch Property Administration Institute has not yet been disclosed nor digitalised, and that there are limited options to search through the files, this is a major advantage. 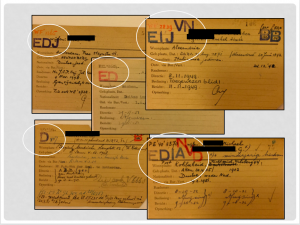 More importantly, the database enables me to count, filter and query my archival data (see http://mariekeoprel.nl/queries.html). 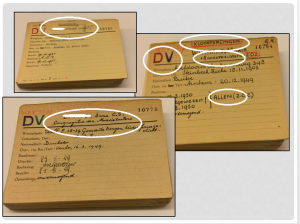 A first sample test (824 cards) proved that it is possible to count how many enemy citizens had the German nationality, and to filter on for example gender or whether the no-enemy declaration was given or rejected. Furthermore, the test showed that it is possible to plot geographical data, such as place of birth and place of residence, and map the geographical patterns of Germans who left the Netherlands, be it on their own initiative or because of deportation (see http://mariekeoprel.nl/data.html. Finally, the sample test indicated that entering the data in a database can help disentangle the bureaucratic apparatus the Dutch Property Administration Institute was. The cards also include a variety of stamps, comments and notes. 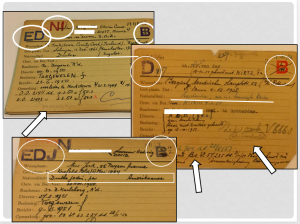 Digitalisation of the cards into a structured database enables to work along and against ‘the archival grain’. 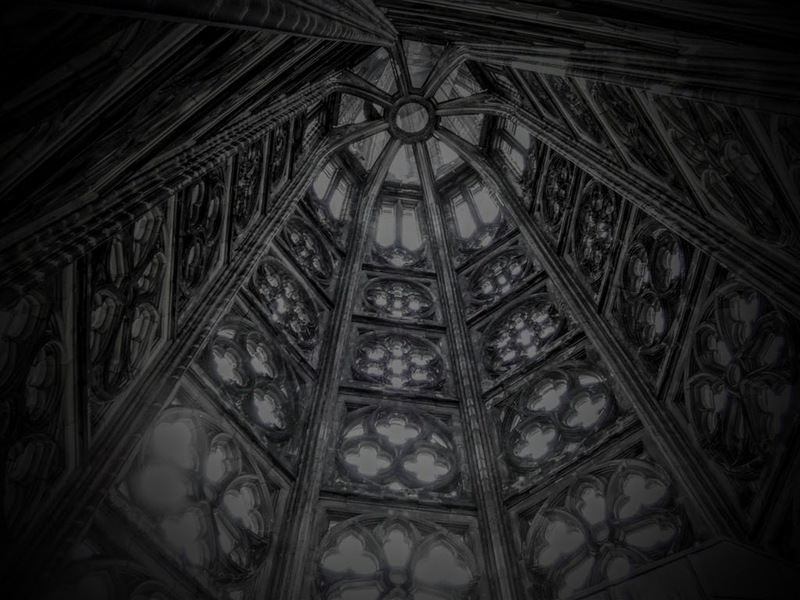 That way, large scale patterns in the archival form can be identified and analysed, as well as the semantic information and in particular the used classifications.